Acknowledging a signature is common practice for most notaries. Sometimes, not all the required information or verbiage is already printed on the document. With just a push of the palm, this PSI Notary Acknowledgment stamp will give you a perfect impression of the required fields for acknowledging a signature. This stamp is guaranteed to have all of the information your state will require of you as notary public in order to authenticate a signature for the document you are notarizing. Unsure if this stamp is the best choice for you? Contact Us today. 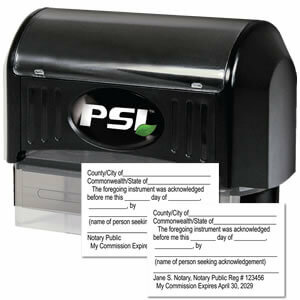 Our PSI Pre-Inked Acknowledgment Stamp comes standard with a clear base which ensures perfect placement every time. This easy-to-use and sturdy stamp was designed with the end-user in mind. With a built in inkwell that can easily be re-inked, this pre-inked stamp is environmentally friendly. This stamp will neither strain your wallet nor hand when using and make your job as a notary public easier. It is a must-have for all notaries that must verify signatures on documents they have notarized. No replacement pads - ever! Do you know when to use the acknowledgment stamp and when to use the jurat stamp? It's easy! When using the acknowledgment stamp, as a notary public, you are swearing that the person who has signed the document is who they say they are. You do NOT have to witness the signing of the document. If you are witnessing the signing of a document, you would use a jurat stamp. When signing the document, the signer must take an oath that he or she understands the contents of the document. Once an oath has been heard and the document is signed, a notary public will stamp their jurat stamp and enter in the required fields per their state requirements.